Go on then, what are these grid cells? As I explained in a previous post, cells in the hippocampal formation encode an animal’s location, speed and direction in exquisite detail as it moves around the environment. Place cells, in the hippocampus itself, fire whenever the animal visits a particular location. The region of the environment where a cell fires is sometimes called its place field. It can be represented in a colour map which shows, for each place in the environment the average firing rate of the cell. Place fields typically have just one peak. By contrast, grid cells fire at different locations all over the environment. The firing fields form an astonishingly regular triangular grid. 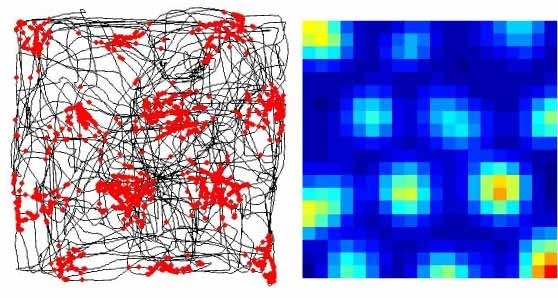 Images: Image 1, Left – path taken by a rat moving around a square environment (black line). Red dots show locations where an individual grid cell in medial entorhinal cortex fires. Right – colour map showing average firing rate for each location in the environment. “Hotter” colours indicate higher firing rates. Source: scholarpedia article on grid cells, by Edvard and May-Britt Moser.Image 2: Yours truly with the Mosers. I was lucky enough to be able to visit their lab for a few weeks in April this year. Grid cells were discovered in the medial entorhinal cortex in 2005 by researchers at the Moser Lab at NTNU, Trondheim, Norway which is led by Edvard and May-Britt Moser. The first paper describing them in detail was published by Torkel Hafting and colleagues. Entorhinal cortex envelopes the hippocampus and entorhinal cells input directly to hippocampal place cells. Let’s be clear: the mere existence of this grid is astonishing. Somehow the cell needs to “know” exactly where the animal is in the environment, despite the fact its path is highly irregular. The sensory information the animal has access to is chaotic. For any given location the pattern of sensory information of at two different times will be entirely different. On one occasion it is running rapidly from south to north, on another, say two minutes later, it is running slowly from east to west. For any two locations in the grid field the sensory information is entirely different: for example, one is near the northern wall of the environment, another is a metre away in open space. There is no systematic relationship between the locations in terms of the smells, sights, or bodily sensations they offer. The peaks of the grid field are places that have nothing in common, other than their regular spacing. Yet, the spatial firing pattern of the grid cell is as ordered as the spacing of atoms in a crystal. So far I have only talked about the spatial firing fields of individual grid cells, but some of their other important properties only become apparent when the firing fields of different cells are compared.The scale of the grid varies. At one end of the hippocampal formation the grid fields are broad and widely spaced. At the other they are narrow and tightly packed. Fascinatingly, the distribution of possible scales may not be uniform – some scales seem to be much more likely than others – and there are some suggestions that scales that co-exist in the brain are “selected” so that their repeating patterns each provide additional information. By combining cells whose scales have non-integer ratios, the brain could ensure that although each individual cell’s firing pattern repeats over a short range, the firing of a population of cells doesn’t repeat for many, many meters. In this way, each location would produce a unique pattern of grid cell firing, and this unique pattern could be used to drive the place cells.Each cell has its own “spatial phase” so that the grid fields of different cells of the same field do not necessarily align with one another. The offset grids fill in the gaps in each other’s firing fields. Even if one grid cell isn’t firing at all, another at the same scale, but with a different offset is sure to be. This seems like an efficient way to ensure each neuron is making a useful contribution to the overall representation of space, where ever the animal goes.The orientation of different grids recorded from the same animal appears to be the same. This means that (at least for a given animal in a given environment) there a six special directions (which form the axes of the grid), a bit like the cardinal directions of a compass N, S, E and W.
Image: Image 1 shows the varying scale of grids recorded from cells at different locations in the medial entorhinal cortex. Cells at the dorsal end (top of figure) have smaller, more tightly packed fields, the size and spacing of fields increases for more ventral cells. Image 2 shows how grid cell output might be combined to produce place fields in the hippocampus (adapted from Solstad et al., 2006). Image 3 shows three different cells recorded simultaneously in a circular environment. Different coloured spots indicate the firing of different each cell. Note that each grid has the same scale and orientation, but the grid peaks are offset from one another. Source: all images scholarpedia article on grid cells. Do human beings have grid cells? We don’t yet know whether humans have grid cells, but there is some evidence that we do. Normally it is not possible to investigate individual cells in the human brain, except in a few rare cases where treatment for epilepsy requires patients to have electrodes implanted. The highest resolution non-invasive functional neuroimaging technique, fMRI, is sensitive to changes in bloodflow around active populations of neurons, but it has nothing like the resolution needed to look at the properties of individual cells. However, because each grid cell fires in a highly ordered spatial pattern, there is a chance that the activity of the population as a whole will show a large scale regularity – perhaps analogous to the way that the structure of molecules can be worked out from large scale properties of crystals. Working on this idea Christian Doeller, Caswell Barry and Neil Burgess reanalyzed data from a complex fMRI experiment in which participants had to run around in a virtual enviroment remembering the locations of different objects. Looking at grid cells in rats’ brains they had found that a proportion of cells fired more strongly when the animals ran parallel to the cardinal directions of the grid (remember there are six, and all cells share similar orientations as outlined above). This means that the overall activity of a population of grid cells is expected to be greater when an animal is moving parallel to the grid. Doeller and colleagues analysed their fMRI data by the direction the human participant was moving throughout the experiment. They first identified the orientation of the grid system by finding the six running directions which produced greatest activity in each participant. Then, using a second, independent set of data, they showed that activation was greatest when their participants moved parallel to the grid. The response had the six-fold directional pattern they had predicted, and this is the best evidence we have so far that a grid system comparable to that discovered in rats exists in the human brain, too. Grid cells give us perhaps the clearest ever indication of the power of neural computation to construct order from chaos. They clearly show that the brain represents the abstract relationship between the animal and its environment in a metric, spatial code. If the hippocampus is a cognitive map, and the caudate nucleus is an autopilot, the grid system in entorhinal cortex is the biological equivalent of a GPS system. Yet the significance of the grid cell discovery may one day go well beyond their role in space, memory and navigation. It is tantalizing to speculate that other forms of information might be represented using a grid-like code. Although the medial entorhinal cortex where grid cells are appears to have some anatomical specialisations for spatial processing, it is not so different in structure and circuitry from other parts of the neocortex, so it is reasonable to wonder whether cells which respond systematically to regular other metric relations between stimuli is not restricted to spatial dimensions, but could extend to perceptual or conceptual attributes, for example those describing the structure of a face, the sound of a word or indeed its meaning.